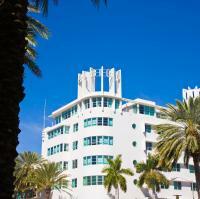 Located in Miami's Art Deco District, this boutique hotel offers rooms with cable flat-screen TV. It offers continental breakfast and is across the street from South Beach. Perfectly situated on South Beach, this hotel is only steps away from the some of the world's most pristine beaches in the heart of the stylishly modern Art Deco District. This Art Deco-style hotel is ideally located only one block from the beach and top area attractions, including Ocean Drive, in the heart of South Beach, and features comfortable accommodations. This trendy Miami Beach hotel offers rooms with plasma TVs and free shuttle services to Miami International Airport, an 11-mile drive away. Guests can enjoy the stylish on-site Safari Bar. This hotel features guest suites with fully equipped kitchens and free high-speed internet access, only minutes' drive from destinations such as Miami city centre and Miami International Airport. This Miami Beach hotel is about 2 blocks from North Shore Open Space Park, which offers a beach. The boutique hotel offers personalized service, free Wi-Fi and free on-site parking. This Miami hotel is only one block from the beach and North Shore Park. The hotel offers an outdoor heated pool and guest rooms with free Wi-Fi. Beach Place Hotel offers free on-site parking and a 24-hour front desk. This Miami Beach, Florida hotel is just 1 block from the Atlantic Ocean. Crest Hotel Suites features an on-site café, outdoor pool and contemporary rooms and studios with free Wi-Fi. Each room offers exclusive artwork and cable TV. Surrounded by a lush tropical garden and overlooking the Atlantic Ocean on Miami Beach, this comfortable hotel offers the perfect beach holiday in a prime location. The Days Inn Oceanside is surrounded by historic Art Deco architecture.